While we’re often not sure exactly where Trump stands on policy due to a bit of early flip-flopping, Twitter rants, and rhetoric we’re told not to take at face value, a project created by Y Combinator President Sam Altman wants to clear it up. Altman joins cofounders Peter Feldman, Alec Baum, and Gregory Koberger in a new, non-partisan website called Track Trump. The goal is to cut out the noise and instead focus on what matters: where we’re making progress. Track Trump is separated into each of the contract’s promises, Immigration, Trade, Energy & Climate, Federal Government, Economic Policy, Education, Healthcare, and Safety. Each item utilizes a simple system of grey (no action), yellow (started taking action), or green (policy has been implemented). 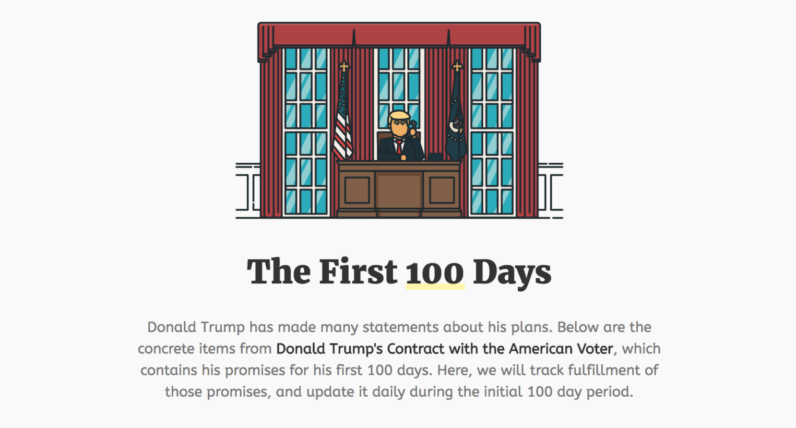 Politics aside, the simple system serves as a great way to keep the President-elect accountable during his first 100 days. It’ll allow you — the people who so passionately (on both sides) followed this election — keep tabs on the President. Whether that’s a good or bad thing is in the eye of the beholder. To keep the fighting at a minimum, Track Trump intends to only follow the issues with no interest in public statements or Tweets. The only updates will occur after actionable progress has been made. Altman told VentureBeat the site may pivot after the first 100 days and focus on longer-term issues.